The third of the Weston Master series, this meter was the last model produced at Newark NJ and also by Sangamo Weston in Enfield, Middlesex in the mid '50s. 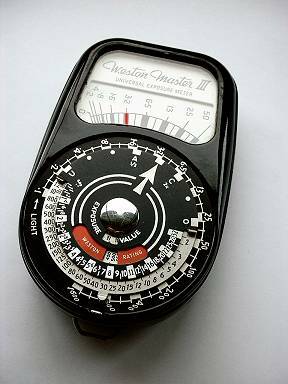 The UK meters were distributed by Ilford Ltd.
Weston IIIs (US Model 737, UK S141). The US model had a stainless steel case much like the model IV. A cine version (S217 - UK only) was also manufactured. 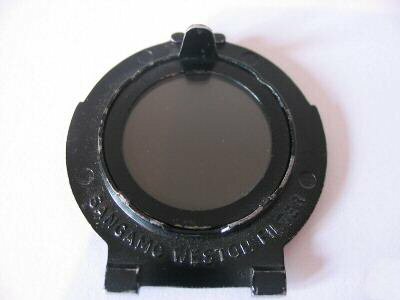 Apart from the dial, they were the same as the Weston II. 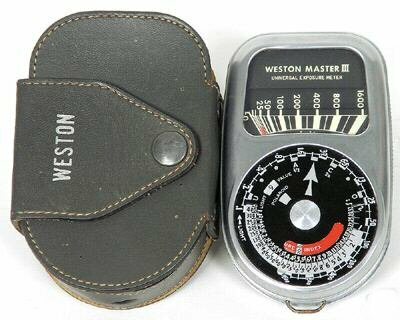 These were the first to use the newly introduced "exposure values" and ASA/DIN ratings instead of Weston speeds which is why they are probably the oldest of the Master series that are still in active use. A filter was available to reduce the light intensity when an invercone was used.